With the exception of events planned by the Club, the following tables illustrates the duration of play and the scheduled time for court changes for weekdays, weekends and statutory holidays. *During public hours please use the City posted sign and place your racket as required to reserve a court. Members must register with the Club Monitor upon arrival at the Club. Members within the fenced area are not deemed to be waiting unless they are registered with the Court Monitor. NO EXCEPTIONS. Members must have their names registered on the sign in board during monitoring hours. A member can only book one court at a time. Additional court time may be booked only after that member has completed their session. Back-to-back court bookings are discouraged if there are other members waiting for a court. Back to back is defined as a player who is playing with one party and is scheduled to play with a different party immediately after the conclusion of the first game. Members are expected to arrange their own games with the exception of club organized social events such as house league, and doubles round robins. A minimum of 2 players is required to claim a court. Members can only reserve the next available time slot on the sign in board. NO ADVANCED BOOKINGS ARE PERMITTED.Prior to the start of the next rotation, one person must be inside the clubhouse or on the patio 5 minutes prior to the court change over. A five (5) minute grace period will be granted to the incoming party. After such time, the court will be forfeited to the next party on the list. The forfeiting party will be required to register with the Court Monitor for the next available court. 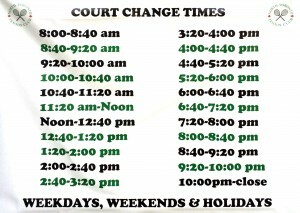 When the court monitor is NOT on duty, members must follow the designated court time changes posted throughout the club grounds. The same court booking procedures will be in place. These rules must be followed throughout the entire season. During week night hours (6:00pm to 10:30pm) Doubles will take precedence over singles up to 8:00pm on all 3 Courts. Thereafter doubles will no longer take precedence. Guests and Juniors are not permitted to play during adult hours. Doubles play will take precedence over singles play if both are waiting for the same court. However, singles will take precedence if the same pair is still waiting when the next court becomes available. See Court Monitor authority below. Priority for taking a court shall be based on the length of time a member has been waiting for a court, and not the number of times a member has played. In all cases, the Court Monitor will have the discretion to ask players (of similar ability) to join other singles matches at the court change. However, singles games already in progress will be allowed to finish play. Non-members adhere to the Member Code of Conduct, Dress Code and Court Change Procedures / Duration of Play.